"Disrespectful" is the title for this clash of a witty wordsmith telling dark tales with a charismatic delivery, of street life involvement meets a gripping, trappy beat produced by Tcustomz which features high horns reminiscent of Just Blaze & Swizz Beats with the baseline of a Dipset anthem. 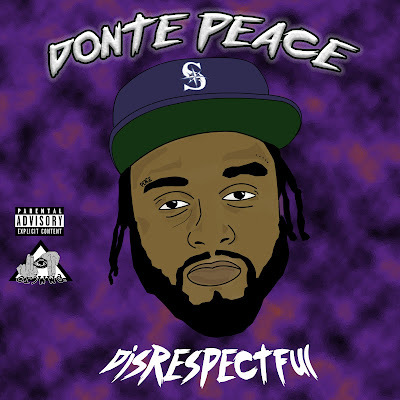 Donte Peace makes it clear with this track "Disrespectful" that he is staying in touch with his Northwest roots as he opens the song saying "Ain't no trappin', I'm soupin', I'm with my older n*ggas" which in Seattle "Soupin'" was slang for selling crack in the early 90's. Donte Peace continues to stay consistent with quality music and releases. Together, Donte Peace created a modern, trappy, dark, gripping record that Peace has referred to as "Grunge Trap". Word even has it that his much anticipated follow project to his "Locals Only" EP is completed. Be sure to follow Donte Peace on his journey as his website and all social links are listed below. Please do share, as always Donte Peace & his team will be sure to send their personal thank you's and share your post as well. Thanks in advance for your time and consideration!